I was doing so well. These past months have been spent eating (relatively) healthily and exercising (Zumba!) pretty regularly. But then it happened. The holiday season started. And with each holiday came one calorie filled delicacy after the next. First came Diwali. By the light of the little diyas, I happily ate one mitai after the next, only pausing for a savory chakli break, and then resuming on the gulab jamun. Then came Halloween. I actually tried not buying any candy this time. I even made Ry take a healthy dish of hummus and veggies for his school Halloween party. But despite my self control, the candy and chocolate flowed into my home from various parties and events and friends. And I am ashamed to admit, when the kids went to bed after trick or treating, I raided their candy bags to my heart’s content. Now it is almost Eid, and my dear hubby has already bought some chocolate and sweets to celebrate. With Thanksgiving and Christmas just around the corner, it is unlikely I can control the glutton within. So even though chocolate and cupcakes are on my mind, I am instead going to post a super healthy and tasty recipe I found on EatingWell to help me get back on track. I just started fitting into some of my old pre-pregnancy jeans and as comfortable as they were, I am not going back to the elastic waistbands of maternity wear! 1. Combine broth, sherry (or rice wine), soy sauce, 1 tablespoon cornstarch, sugar and crushed red pepper in a small bowl. Set aside. 2. Cut tofu into 3/4-inch cubes and pat dry, then sprinkle with salt. Place the remaining 2 tablespoons cornstarch in a large bowl. Add the tofu; toss gently to coat. Heat 1 tablespoon oil in a large nonstick skillet or wok over medium-high heat. Add the tofu; cook, undisturbed, until browned, about 3 minutes. Gently turn and cook, stirring occasionally, until browned all over, 2 to 3 minutes more. Transfer to a plate. My tofu is somehow never crisp, but still a bit soggy, although it is hard enough to not break apart. Any tips on getting a nicer crust on my tofu would be much appreciated. 3. Reduce heat to medium. Add the remaining 1 tablespoon oil, garlic and ginger, few chili flakes; cook until fragrant, about 30 seconds. Add broccoli (and water if fresh broccoli); cover and cook, stirring once or twice, until tender-crisp, 2 to 4 minutes. Stir the reserved broth mixture and add to the pan. Cook until the sauce has thickened, 1 to 2 minutes. Return the tofu to the pan; toss to combine with the broccoli and sauce. 4. Serve over brown basmati rice and a bit of Sriracha sauce. 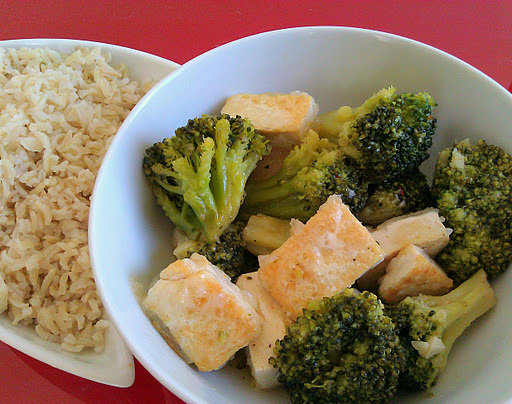 This entry was posted in Lunch, Main Course, Vegetarian and tagged Broccoli and Tofu Stir Fry, healthy, Vegetarian by thepantrydiva. Bookmark the permalink. This looks really YUM-O! Its a must try.Tempeh is another great replacement for Tofu. Thanks for the tip! Yes try it you will love it…I just discovered brown basmati myself and I looove it.